It was not long after Europeans began using Christmas trees that special decorations were used to adorn them. Food items, such as candies and cookies, were used predominately, but also, straight white candy sticks were one of the confections used as ornaments in the 1400’s. Legend has it that during the 17th century, craftsmen began creating the white sticks of candy in the shape of shepherds’ crooks at the suggestion of the choirmaster at the Cologne Cathedral in Germany. The candy treats were given to children to keep them quiet during ceremonies at the living creche, or Nativity scene, and the custom of passing out the candy crooks at such ceremonies soon spread throughout Europe. Shepherds have a prominent place in the story of Jesus. The first people to be told of the birth of Jesus were shepherds who were keeping watch over their flocks that first Christmas night. Throughout scripture Jesus is referred to as the Good Shepherd and we are called His sheep. When you look at the candy cane and especially the crooked end, think on Psalm 23:1-4 The Lord is my shepherd; I have everything I need. He lets me rest in green meadows; he leads me beside peaceful streams. He renews my strength. He guides me along right paths, bringing honor to his name. Even when I walk through the dark valley of death, I will not be afraid, for you are close beside me. Your rod and your staff protect and comfort me. 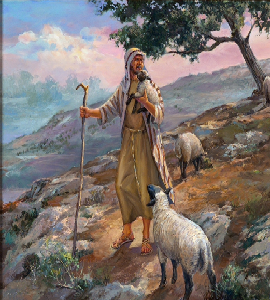 The shepherd carries a staff or rod with him when he goes forth to feed his flock. It is often bent or hooked at one end. With this staff he rules and guides the flock to their green pastures, and defends them from their enemies. Also, with his staff, he corrects them when they are disobedient, and brings them back when they are wandering. Another explanation of the candy cane is that in the 1870’s a candy maker in Indiana wanted to make a candy that would be a witness so he shaped it in the form of a “J” to represent the precious name of Jesus, and he made it hard to symbolize Jesus being our Solid Rock. It is widely held that the white color repesents Christ’s purity, the red stands for the blood He shed, and the presence of three red stripes is representative of the Holy Trinity. It is also interesting that the candy is peppermint flavored; mint is a healing herb that is common in the Holy Land and is believed to be one of the bitter herbs of the Last Supper. Just remember the next time you eat a candy cane that “J”esus came to be our Good Shepherd who heals our hurts and guides us with His staff.